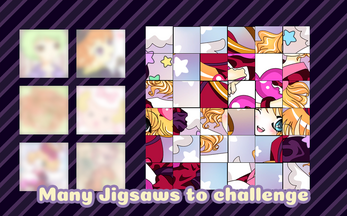 If you like Anime or Illustration, and want to challenge the jigsaw puzzles, then this game is the answer. It is a highly addictive and relaxing game with the high quality in original graphics and designs. And, it will be more fun when you play with friends and family. First, try it and enjoy! Jigsaw puzzle x Bedtime Story Game: Released! New Anime Jigsaws and Puzzles is released!